Marg and I read Connie Willis' To Say Nothing of the Dog together and loved it. We agreed to do a buddy read of Willis' more famous novel, Doomsday Book, as quickly as possible. And now here we are with the discussion, just a little bit later than we had planned. Doomsday Book is a time travel novel that takes place in the mid-21st century and the mid-14th century. Kivrin, the main character, is a scholar of the Middle Ages and wants desperately to go back in time and experience it for herself. So she does, against everyone's better judgment, and ends up in a small English town outside Oxford and tries to assimilate herself into life in the early 1300s after getting violently ill. Meanwhile, in the 21st century, there has been a horrible outbreak of an unknown disease and everyone is under quarantine. Willis uses these parallel story lines to show just how much has changed and how much has stayed the same over seven centuries of history, and just how devastating a pandemic can be, if you don't know how to treat it. And thanks to Marg for reading this with me! Marg: One of the other major characters was the priest. I found the relationship with the priest to be quite unsettling at times. I wasn’t sure for whether he was a friend or foe for a lot of the book. What did you think of him? Aarti: I ended up really liking the priest. He seemed to be trying his hardest to keep faith and help people even when everything was falling apart. Marg: He certainly found himself in a very trying position with the matriarch of the house having decided that he wasn’t a good enough priest! She would have been enough to try the patient of any man! Aarti: So true! I suppose that was Willis’ way of showing the latent classism that existed at the time. It seems to be present in so many books about the Middle Ages - or really, any age except the modern one. One aspect of this book I really liked was the juxtaposition of the plague in the 1300s vs. the infection in the 21st century. While not as many people died in the 21st century, there was still the sense of bewilderment and helplessness that was so prevalent in the 14th century. Marg: We are definitely susceptible to panic in relation to viruses. We saw that a few years ago with the SARS virus and bird flu. Yes, technologically we can react quicker with vaccines and with different levels in care and so many less people die but there is a still a human cost for such outbreaks and that was played out really well on the page. Aarti: One thing that always upsets me in books but that is very true to life is when people die so abruptly and you have no idea that it’s coming and when you think back on your last conversation, you wish you could have said and done so many other things. I think Willis captured this well. Marg: Another aspect that I thought was very well done was the idea that Kivrin had done so much preparation for her trip back to medieval times but when she got there life and language was actually pretty different. We do kind of blindly accept when historians say this is what life was like, but it is their interpretation of the archeological finds and the literature and historical recordings of the time, so it does make sense that at times the conclusions that are gained might be just a little bit off. After all, there are people who live now who have very different lifestyles so a one size fits all type of generalisation about life in the 21st century wouldn’t necessarily work all that well now either. Aarti: Yes, I liked that, too! I’ve always wondered how linguists can figure things like that out, and it was interesting to see how Kivrin had to adapt to things that were completely different than what she was expecting. I wish we had more of that - more of learning about the everyday aspects of life and how people lived then, rather than the never-ending desperation to find the drop site. It seemed like Kivrin tried so hard to get to the Middle Ages, and then when she got there, she was just desperate to get back, so we missed a lot of what was really going on then. Marg: It seems kind of weird to say it given that we are talking a book that is set in the future and features relatively routine time travel, but I did find this book a bit dated in some ways. it’s not surprising given the book was originally written in 1992 and our technology has moved forward a lot but it would be hard to imagine a future life without some variation on cell phone technology for example. Aarti: Yes! That was something that struck me, too - that people were so completely inaccessible in the 21st century, when that would just not really be an option today. There was video-conferencing but no thought of cellular phones. I agree - that detail in and of itself made the book seem quite dated. Especially as I’m pretty sure cell phones existed even in 1992. Marg: I am trying to think when I got my first cell phone and it probably wasn’t for another few years after that so maybe it was only early adopters that had them and it wasn’t really obvious how huge a part they were going to play in future life! I think the inaccessibility issue was quite realistic though. You only have to look at big disasters like 9/11 and the bushfires, hurricanes and other natural disasters to know that the telecommunications systems quite often are overloaded and therefore collapse. Aarti: Yes, that’s been made very clear with Hurricane Sandy in very recent history, too. We are so dependent on technology, so when it fails, we are at a complete loss. Marg: He’s in the blurb at least! I'm taking this book with me on my holiday this week so I'll drop by after I finish. Can't wait to read it! This is one of my favorite books of all time, and I love that you guys read this together! I agree that it is a bit dated, but the parts of the story that take place in the past really got to me. That little girl...oh, I sobbed and sobbed. Great joint musings on this one today. Two of my favorite bloggers discussing my favorite book! I adored this book but I ought to do a reread -- it never felt dated to me, but I was so caught up in the emotion and story. I love that you two shared your thoughts, however late they might be! Such fun to read! This is one of my favourite books of all time, too! I really enjoyed reading your thoughts on the book, both of you. Interesting that you both liked To Say Nothing of the Dog, which for me is enjoyable, but has none of the impact Doomsday Book does. I reread it for the third time a few years ago, and I found it as moving as ever. I think because it was set in the future, the lack of cell phones didn't trouble me - it wasn't commonly used until late in 1990's, and since Willis foresaw a world more interested in travel and health cures than communication I accepted it. I loved the idea of going back in time, and how she shows that it's different than how we interpret - that to me is one of the things that makes this book stand out for me. I'm glad you both enjoyed it so much! One of the main themes in Willis' books is communication problems. So we don't get cell phones even in her more recent works - Blackout and All Clear. I do wish she had addressed that technology rather than just ignoring it, but I'm willing to forgive her because she's such a great writer. Colin is in Blackout - and oh my, he turned out to be a pretty fine adult indeed. Infact I would say adult Colin is my favourite literary character ever. I love what y'all say about the suddenness of death. 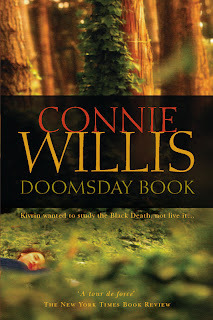 I wasn't a huge fan of Doomsday Book -- or, to my unceasing sorrow, of Connie Willis generally -- but I agree that she did that aspect of it very well. I've been reading so many YA books lately for class and a few that deal with time travel. It got me thinking I need to find an ADULT book that deals with the topic, because I think time travel is super fun in literature. Never heard of the author before, but I'll add this to my list of Eventual Reads Once the Semester Is Over (a very long list...). The sudden and capricious nature of death was what got to me about this book. Kivrin kept clinging to the stats about survival rates, but the lived experience goes so far beyond statistics. It was awful to watch that happen--and then to see that in the future all those technological advances couldn't halt death any better than the Medieval prayers could. I think that, like you both, I enjoyed To Say Nothing of the Dog more than this one. The narrative was tighter, overall. But this one was much more moving and intense, so it's hard to make comparisons. I've seen discussions of the lack of technology in Willis' future settings before, and I think that part of the problem is that she had to keep the worldbuilding consistent. Mobile phones were just starting to become popular in the early 90's, but I guess she didn't predicted how popular they would become, and now she's kind of stuck with that. I say this because this lack was mentioned a lot in relation to Blackout/All Clear, which are more recent - and of course that only makes their absence stranger. Anyway, when it comes to comparing this a TSNotD, I agree with Teresa. I think I preferred it too, but this one moved me more. I don't want to read this post yet! I so want to read this book. I LOVED this book when I read it years ago. I still haven't read To Say Nothing of the Dog, but hopefully it will happen soon! Connie Willis is one of my favorite writers, and this is my favorite book of hers. Great discussion! There are so many plots that wouldn't happen now because of cell phones, but it's true that they don't always work, they get broken, batteries go dead, cell phone service is down, etc. Some New Yorkers couldn't get cell phone service for a while the day after Sandy, right? That's a great point that sarah made that broken communication is a theme that runs through Connie Willis' books. I'd never heard of this book, but someone else (and not Marg) just mentioned it. It looks really interesting! I might have to add it to the vacation reading pile for next month. Black out is awesome. Can't wait for that post!